View More In Laptop Network Adapters - Page 2. 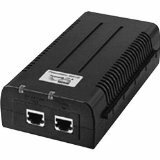 The powerdsine 9501G is designed specifically to power IEEE 802.3at access points, pan-tilt-zoom (pts.) and DOME cameras, IP videophones, thin clients and other high power Ethernet End terminals with 60W of power.. provides an extensible design that enables Service prioritization for data. Design that delivers high availability, scalability, and for maximum flexibility and price/performance. The country of Origin is philippines. If you have any questions about this product by Microsemi Corporation, contact us by completing and submitting the form below. If you are looking for a specif part number, please include it with your message.